There were a handful of strange movable and immovable obstruction rulings on the professional circuits last week. 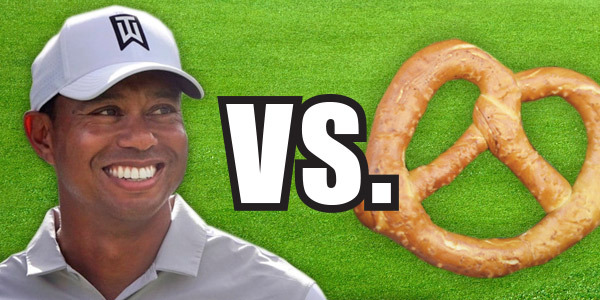 At the Honda Classic on Thursday morning, Tiger Woods had a run-in with a hot pretzel cart when his errant drive on the twelfth hole landed directly behind it. Fortunately for Tiger, the cart was considered to be a movable obstruction and was subsequently wheeled off to the side and out of the way by a couple of onsite tournament officials. Tiger went on to make a par on the hole. 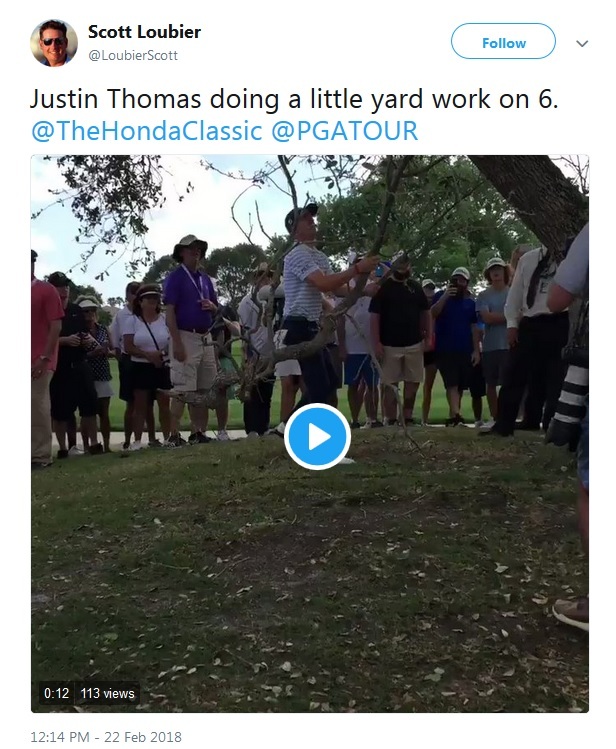 At around the same time on the 5th hole, Justin Thomas missed his tee shot well to the right of the fairway and found his ball stuck behind an enormous dead tree limb that was hanging from a nearby tree. Because the limb was dead, it too was considered to be a moveable obstruction, so the reigning PGA Champion yanked it out of the tree himself. As you can see in the video below, the branch was lodged in there pretty good and JT needed to get a solid grip on the limb to move it aside! The following morning in Thailand, US superstar Lexi Thompson had an unfortunate obstruction issue of her own at the Honda LPGA when her tee shot on the 15th hole nuzzled up next to an advertising sign. Thompson was under the impression that the sign was a moveable obstruction — like they normally are at many other LPGA tournaments — and moved it aside without first checking with an official. However, when the American went into the scorers’ tent at the conclusion of her round, she was informed that the sign was an immovable object and that she would be assessed a two-stroke penalty. 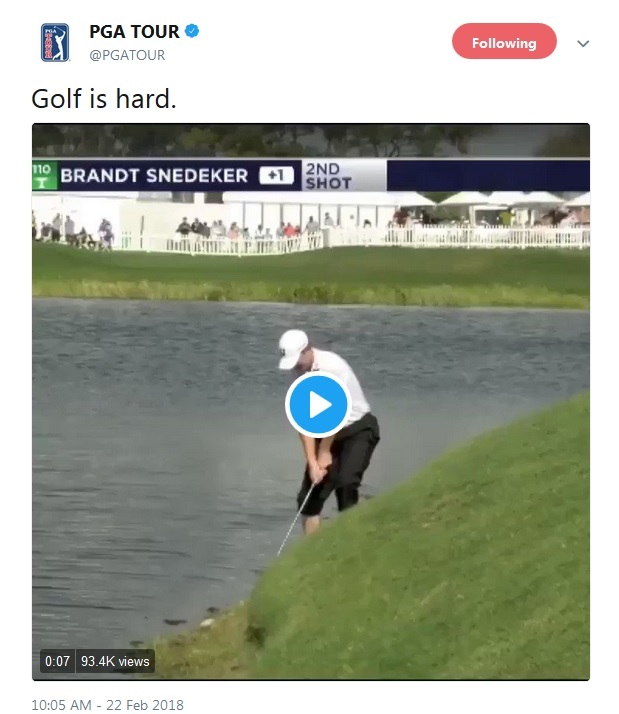 Two players attempted shots from the water during the opening round of the Honda Classic and the results could not have been more different. On his second hole of the day, Brandt Snedeker experienced a mini-nightmare when it took him three tries to hit his ball out of a greenside pond. He failed to advance it outright on his first attempt, hit it about two yards total on his second try and watched in horror as his ball rolled back into the water, and then finally made contact on his third crack at the shot. Snedeker made a triple bogey on the hole and went on to miss the cut by two strokes. 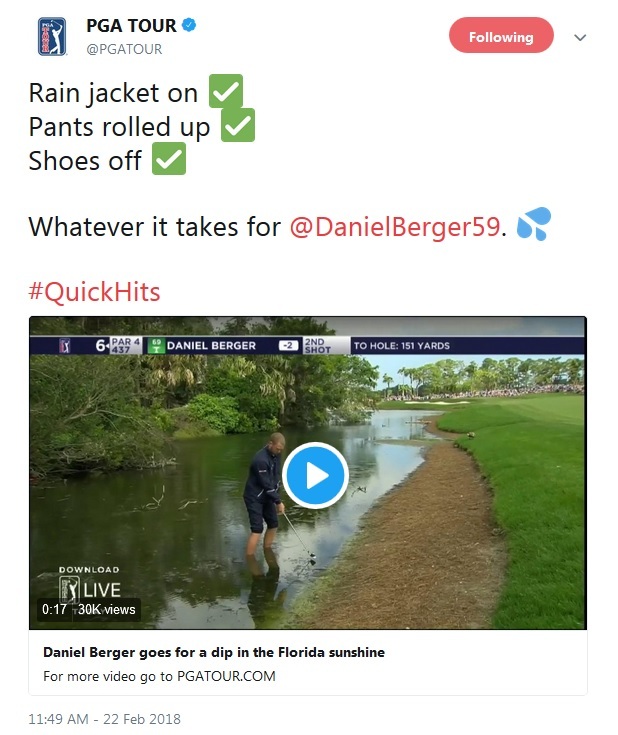 Daniel Berger, on the other hand, had way more success with his aquatic shot. After finding the water hazard on the left side of the sixth hole, the Floridian took a heroic swipe at his fully submerged ball and advanced it over 100 yards. Berger lost his balance in his follow through and nearly fell into the water. But the somehow managed to stay on his feet and then went on to save his par a few minutes later! I don’t know how we missed this video of PGA Tour pros re-enacting Bill Murray’s iconic Cinderella-story monologue from Caddyshack last month. 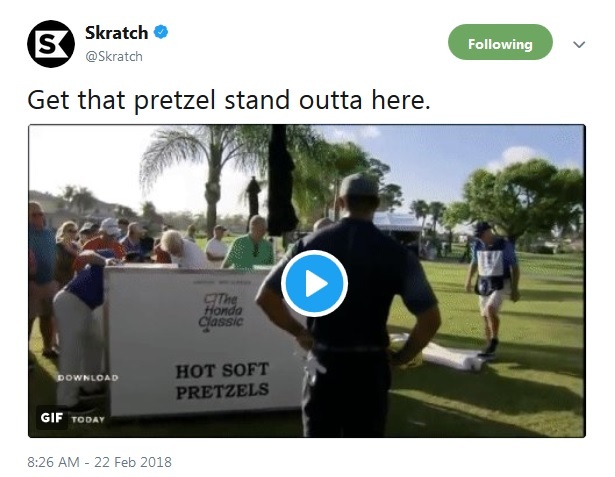 The video was compiled by the PGA Tour’s internet video network, Skratch TV, which has done a commendable job over the last three years showcasing the diverse personalities of the circuit’s numerous stars. The video is hilarious and well worth a watch to see the various impressions — especially Bryson DeChambeau’s homage. 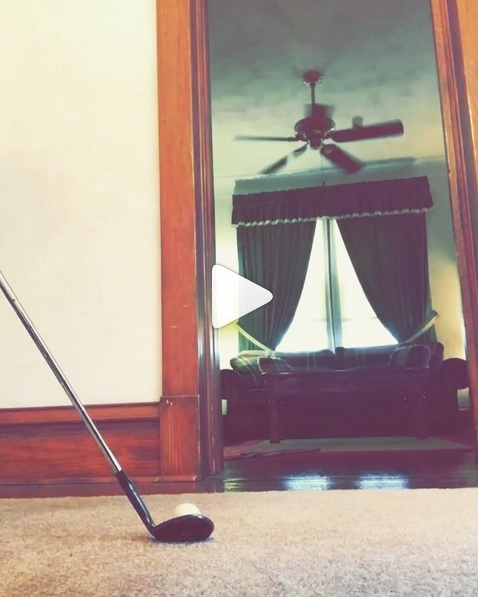 It appears that the 24-year-old has spent a considerable amount of time watching Caddyshack and recreating Murray’s swing from the movie because his impression is spot on! Of course, the video also features a few hilarious and terrible impressions, courtesy of Andrew Beef Johnston, Shane Lowry and Boo Weekly, who, despite trying earnestly to mimic Murray’s tone, all still sound exactly like themselves! A Midwestern man came away from the Minnesota Golf Show two weekends ago with a brand-new boat and a cheque for $25,000 after nailing a downhill 120-foot putt in front of a large crowd. The Minnesota Golf Show has been offering the same contest for 28 years and no one had ever made the putt before. There has been no word on whether the putt will be offered again at the convention next year. But, if it is, the contest runners might want to consider moving the hole back another 20-30 feet! This is one of those trick shots that gets more impressive every time you watch it!